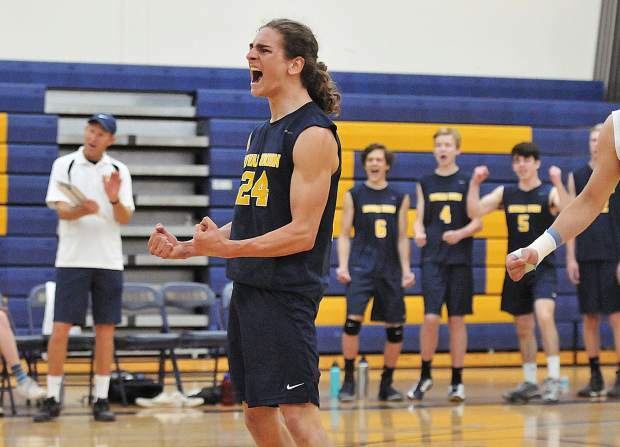 Nevada Union volleyball team captain Nick Ashbaugh reacts after the team scores a point against the Ponderosa Bruins during Thursday night's playoff win. 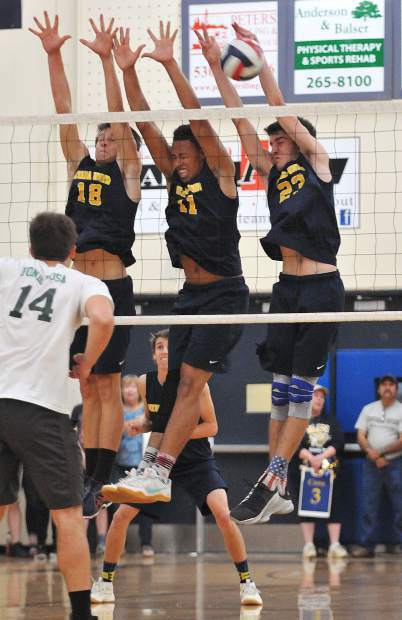 Nevada Union's Preston Nowak, Cameron Dallago, and Jordan Mills provide a defensive wall and block a Ponderosa hit Thursday night at Nevada Union. 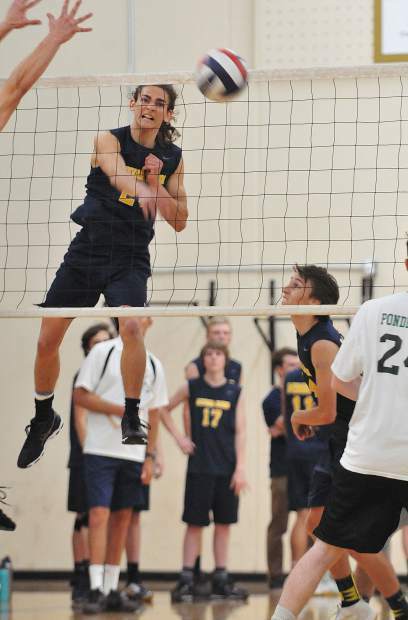 Nevada Union High School senior Ibrahim Torkman, slams a spike over the net during the Miners second round playoff win over the Ponderosa Bruins in three straight sets. 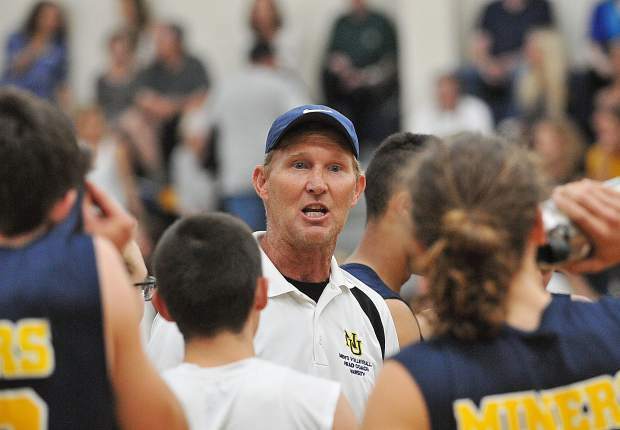 Nevada Union varsity boys volleyball head coach Lance Mansuetti keeps the intensity of his team up while the team readies to play their third set for the win over Ponderosa Thursday night at Nevada Union High School. 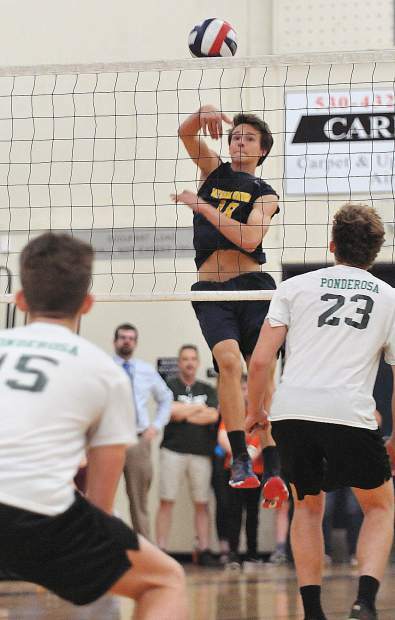 Nevada Union's Preston Nowak floats the ball over the net during the Miners three set win over the Ponderosa Bruins. 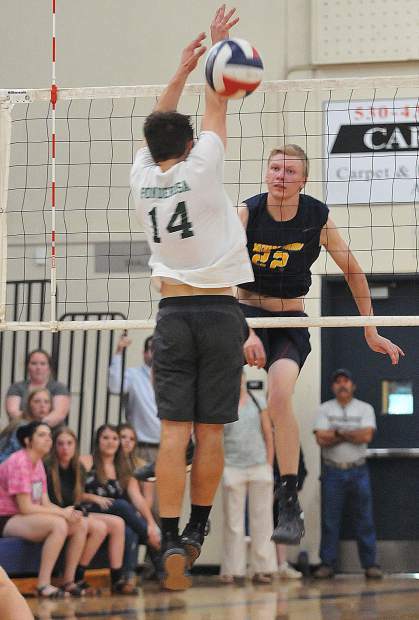 Nevada Union High School 6-foot 5-inch senior Tanner Quiggle watches his spike pass a Ponderosa High School defender during the Miners second round playoff win in three straight sets. 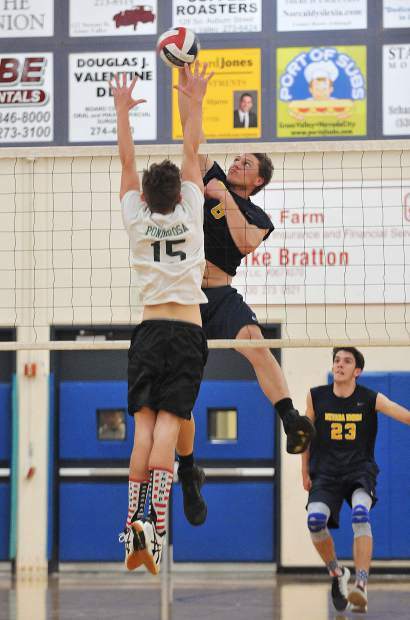 The Miners are moving on to the Sac-Joaquin Section Division I boys volleyball semifinals after a dominating straight set playoff victory over the Ponderosa Bruins Thursday night at Albert Ali Gymnasium. 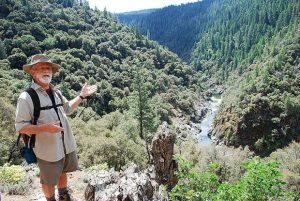 Nevada Union, the No. 3 seed, set the tone early with a barrage of high-flying, powerful kills that No. 11 Ponderosa struggled to contend with. After taking the first two sets 25-13, 25-13, the Miners were tested a bit in the third set, but rallied from a 13-12 deficit to win, 25-18. Nevada Union hitters were in fine form against the Bruins, getting emphatic spikes from multiple players. Jordan Mills finished with 10 kills. Also contributing for NU was Ibrahim Torkman with five kills, Tanner Quiggle with four kills, Riley Nelson had three kills, Cameron Dallago had three kills and Preston Nowak had two kills. Running the offense and setting up NU’s hoard of hitters was Sam Hales and Trevor Johnson with 18 assists and 15 assists respectively. Leading the NU defense was Joey Cena with 26 digs. 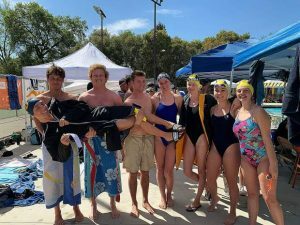 The Miners (31-4) have now won 12 straight matches and are just two victories away from claiming their first ever Sac-Joaquin Section Championship. 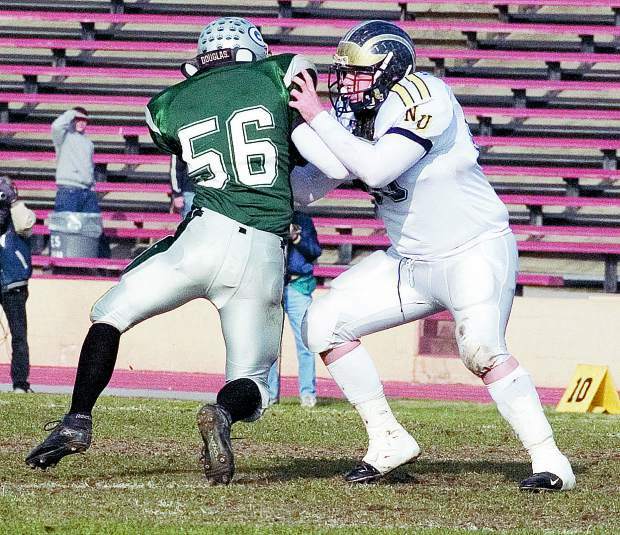 Next up for Nevada Union is a 7 p.m. Tuesday semifinal bout in Rocklin against No. 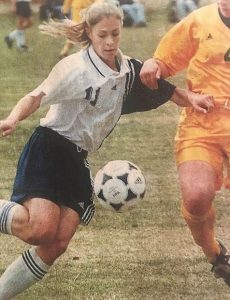 2 seed Whitney, who topped No. 7 Woodcreek in four sets in the second round.